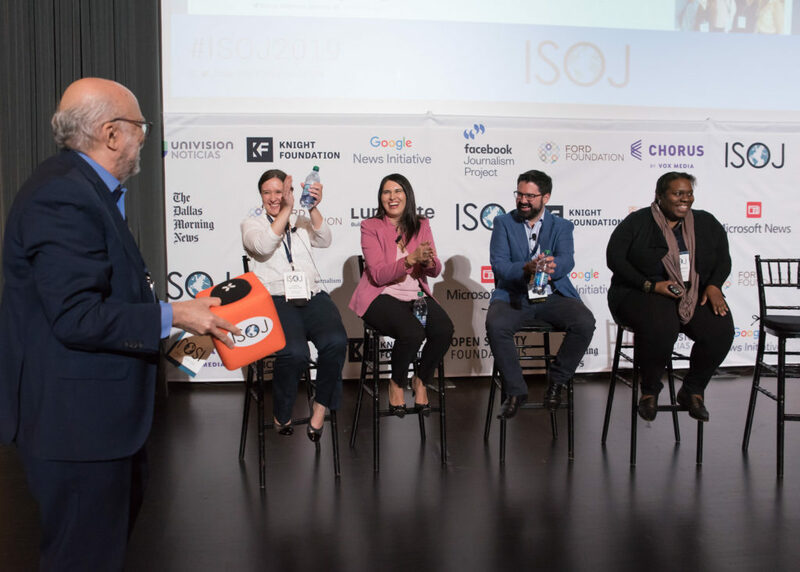 During the research panel “Digital media and democracy in the Americas” at the International Symposium on Online Journalism (ISOJ) on April 12, three scholars shared their research and unveiled the limits of journalism in holding the powerful accountable across in Uruguay, Cuba and Chile. “One of the most important roles of journalism is holding the powerful accountable,” said Eugenia Mitchelstein, associate professor and director of the Communication Degree at University of San Andrés, Argentina, who chaired the research panel. Federico Comesaña, of Universidad Católica del Uruguay, started off the discussion by sharing his research with Matías Dodel and Daniel Blanc, which looks at the effect of 2018 FIFA World Cup on Uruguayan news coverage of political issues. Comesaña and his colleagues’ research, “A case of reverse-agenda setting: How 2018’s FIFA World Cup coverage reduced media reporting of Uruguayan budget bill’s yearly revision,” tracked news reports within three Uruguayan media conglomerates: El País, El Observador and Montevideo Portal. They investigated if and how the World Cup accounts for changes in news coverage of the national budget bill’s yearly revision. According to the findings, news media sites in Uruguay reduced their reporting of the budget bill’s entry to parliament during the World Cup, said Comesaña. A key theory associated with their work was agenda setting, which traditionally looks at how the news media sets the public’s agenda. She interviewed 35 young Cuban journalists at nine media organizations in 2017 and documented how they use digital media to address issues that are changing Cuba. Roberts attributed their aspirations to the impact of Cuban blogs, which have boomed with over half having news operations outside of the country. “They want to develop careers like the more prominent blogs,” Roberts said. The young journalists also used the more economically affordable social media, PDFs, and email to disseminate their content, Roberts said. Magdalena Saldaña, an assistant professor in the School of Communications at Pontificia Universidad Católica de Chile, and a junior researcher at the Millennium Institute for Foundational Research on Data (IMFD), closed the panel by discussing her research on how journalists covered the earthquake in northern Chile in 2014. Unlike coverage of a natural disaster in 2010, the Chilean journalists approached the 2014 earthquake in a highly politicized manner, Saldaña said. The main news coverage was not human interest-based stories, but instead it was from the political angle, she added. Saldaña interviewed 15 political journalists who covered the 2014 earthquake to explain why they reported the news in such a way. “It was mainly editorial prompting,” said Saldaña, adding one journalist admitted the editor decided the news angle. Another reason why journalists covered the earthquake as a political issue is driven by their intention to expose President Michelle Bachelet, Saldaña said. Saldaña further explained that such intentions are shaped by the different ideologies between the center-left president and right-wing media outlets. At the end of the panel, Saldaña stated that political journalists in Chile did not see usual news readers as their audience. Rather, they write for political analysts, political elites and fellow political journalists. These scholars’ research appeared in the #ISOJ Journal.